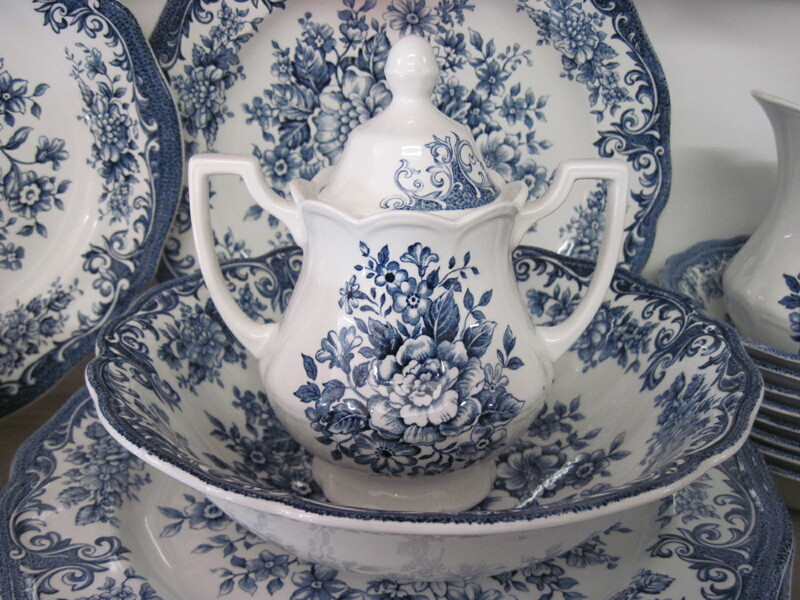 Beautiful plaid patterned dished by Hycroft, out of Medicine Hat Potteries in Alberta. The pattern is called Calico. 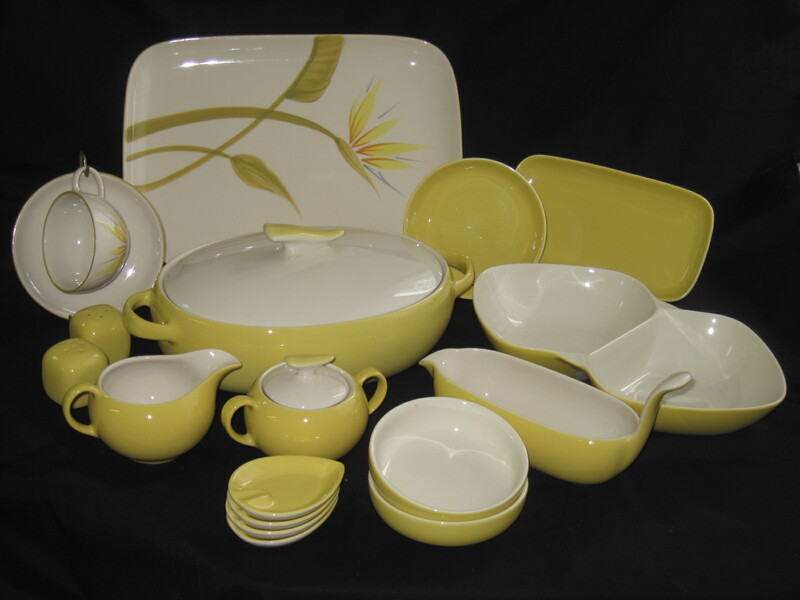 The dishes came in the above colours as well as in yellow. I would date the dishes to the latter half of the 1950’s or early 60’s. 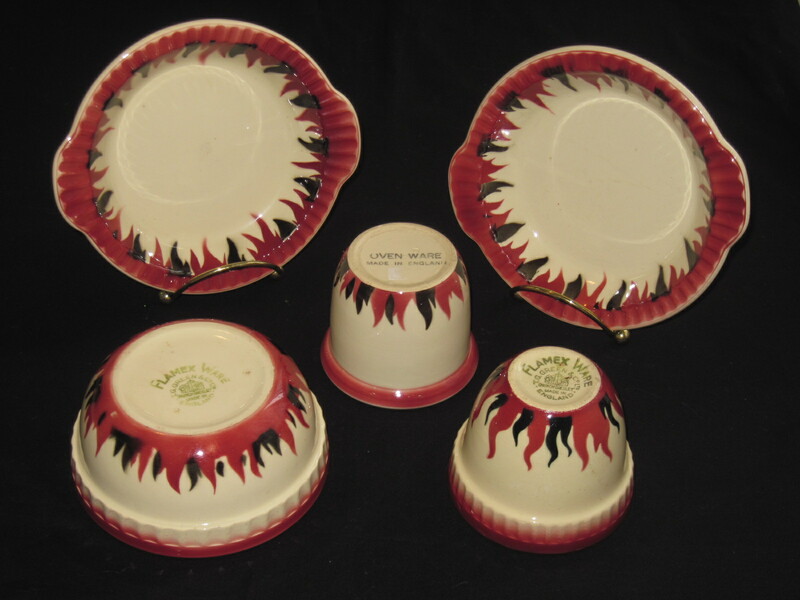 It was only after 1955 that the name Hycroft was used on the dishes by Medicine Hat Pottery. The dishes are individually priced. If you have any questions or wish to purchase any of them, please contact me at afacette@gmail.com. I have other pieces available as well. In the photo there are five cups and saucers, three side plates, creamer and covered sugar. Please note these dishes are now SOLD!! 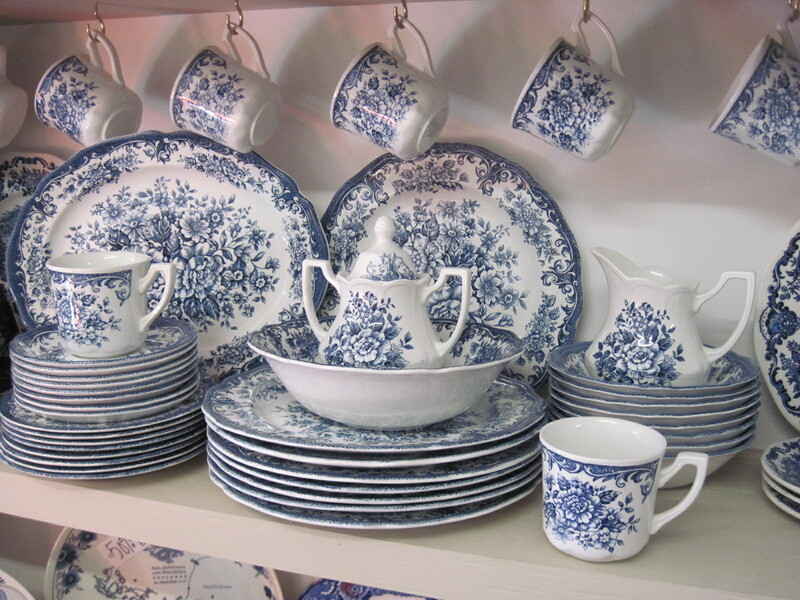 These dishes were manufactured by J. 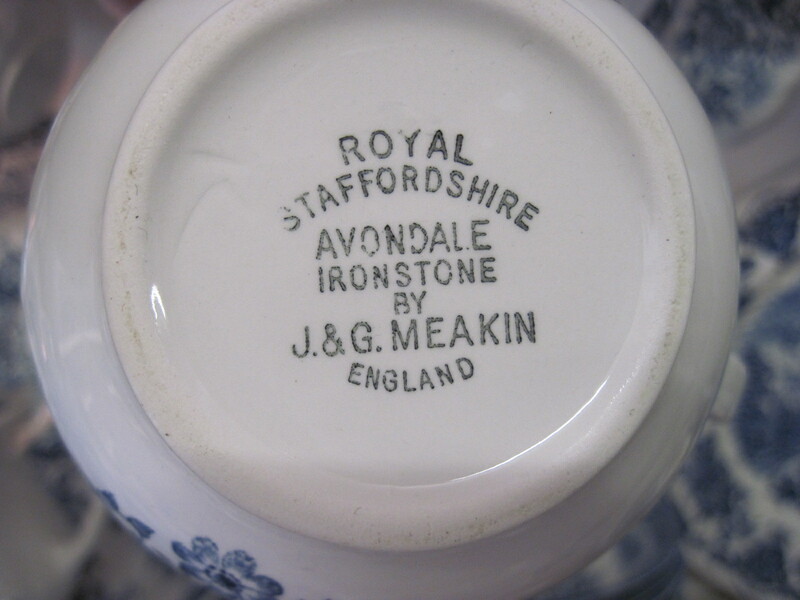 & G. Meakin Co., Royal Staffordshire England, ca. 1960’s or early 70’s. The pattern is called Avondale. 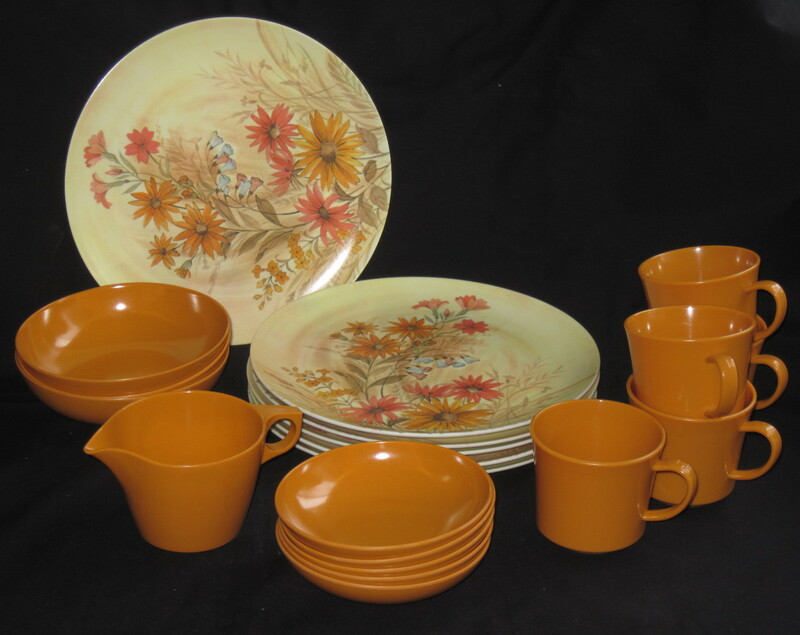 I have 8 complete place settings which includes dinner plates, side plates, cereal bowls, cups and saucers. Also included are a platter, vegetable serving bowl and cream and sugar. All dishes are in excellent condition with very little sign of wear to the surfaces. Several mugs are slightly lighter in colour. They may have been used a bit more compared to the rest of the set. Overall wonderful vintage condition. This set is currently available at my booth at the Almonte Antique Market, 26 Mill Street, Almonte ON. Open 7 days a week from 10am to 5pm, all year round. There are over 50 vendors in the Market which is a 2 storey brick heritage building on the main street of Almonte. These dishes are now SOLD!!! 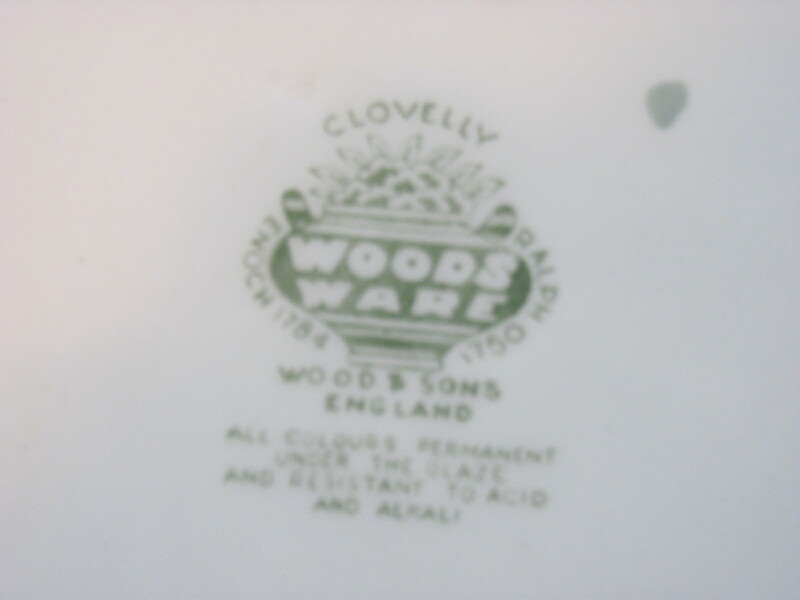 Covered casserole and Platter by Wood and Sons of England. Pattern is Clovelly. Dates to the late 50’s or early 60’s. Both pieces are in nice vintage condition, no nicks or damages that I could see. 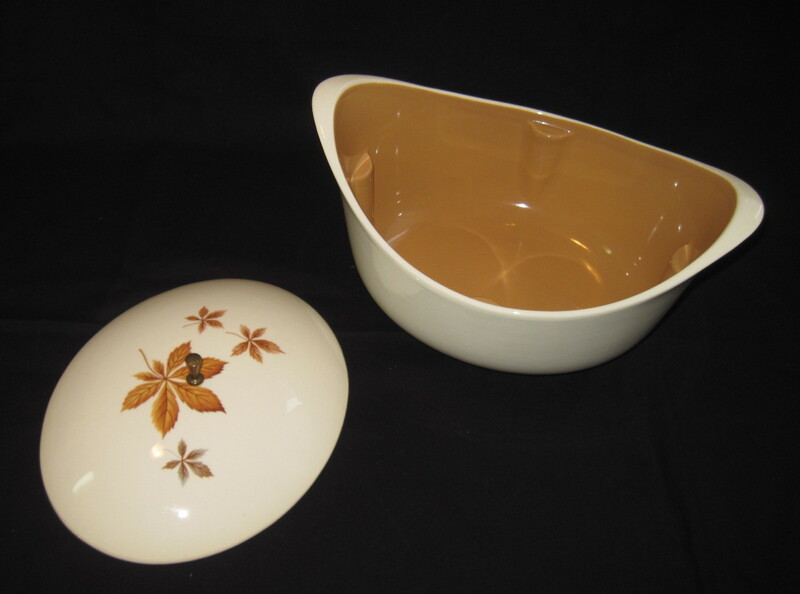 If you would like to see this item and many other vintage dishes from the mid 20th century, please visit my booth Fab Finds at the Almonte Antique Market, 26 Mill Street, Almonte ON. Just 30 minutes west of the city of Ottawa ON. This casserole is priced at $ 20 and the platter is $15. 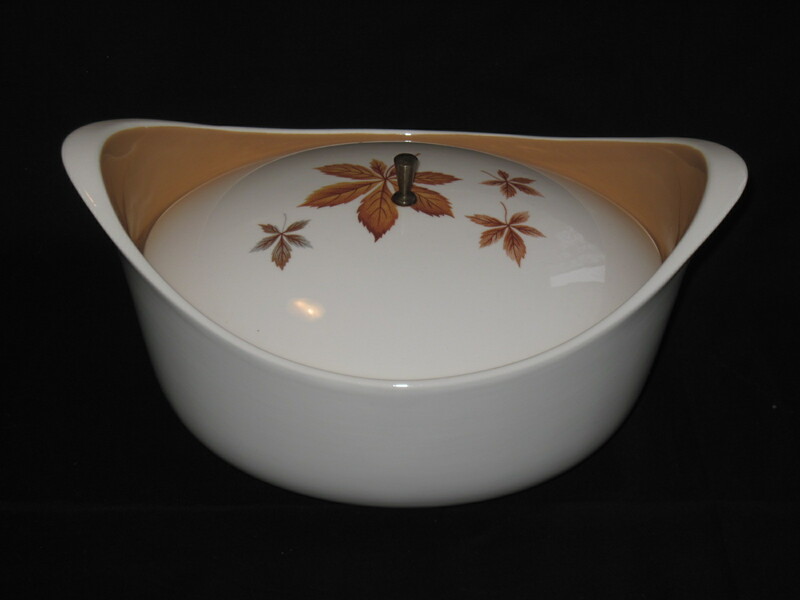 This uniquely shaped covered casserole dish was manufactured by TS&T, which stands for Taylor, Smith and Taylor, in the USA. Dates from 1959 to 1965 when it was discontinued. This is from their ‘Ever Yours’ Line of dishes. 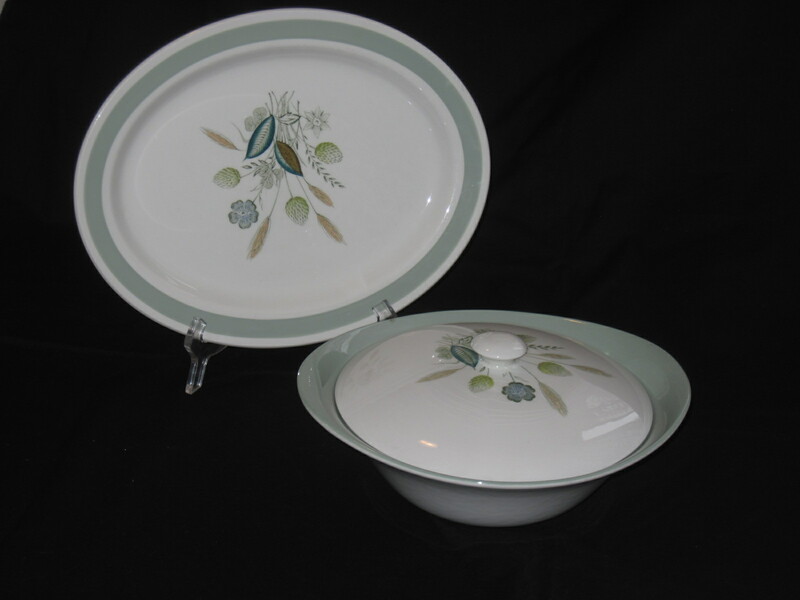 This casserole is in very nice vintage condition, with no nicks or visible wear to the surfaces. The pattern may be called Random Leaves or Brown Leaves. The inside colour is a dark pumpkin shade. These are rare pieces of T.G. 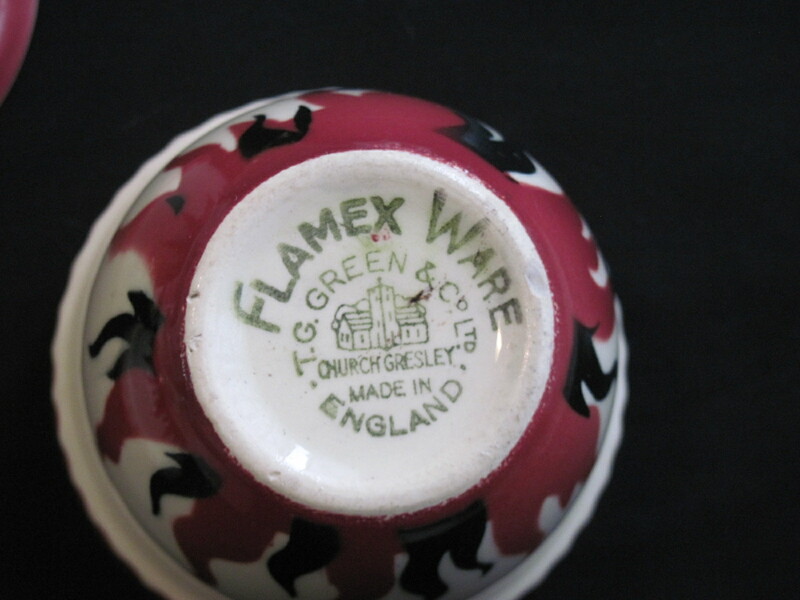 Green & Co. Flamex Ware. Very difficult to find. This is the culmination of over 10 years of collecting so you can see that they are not in abundance. The backstamp dates from the 1930’s. There are 2 different styles of custard cups, 1 small bowl and 2 small dessert bowls These pieces are not for sale at the moment. I would have a hard time parting with them just yet. Fab Finds at the Almonte Antique Market, 26 Mill Street, Almonte ON. It is open 7 days a week, 10 to 5, all year long. There are over 50 vendors with a huge variety of items housed in a 2 storey heritage building.